Southern freshman Lily Allen pressures Miller sophomore Alaina Boyden (24), during the Lady Falcons’ 43-22 sectional semifinal victory in Rocksprings, Ohio. ROCKSPRINGS, Ohio — As it turned out, the third time wasn’t the charm. The No. 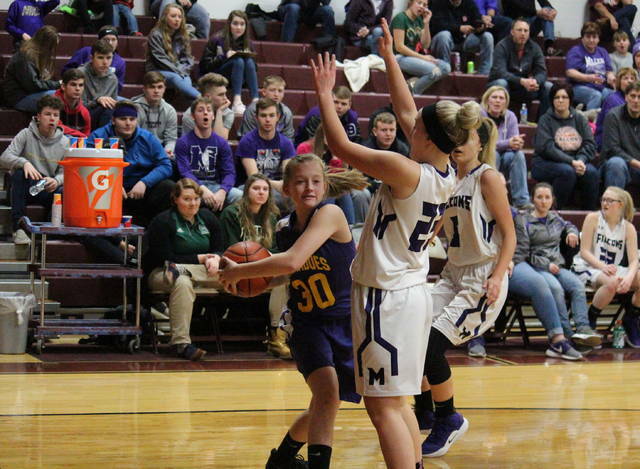 10 seed Southern girls basketball team met with seventh-seeded Miller for a third time on Wednesday in the Division IV sectional semifinal at Meigs High School, with the Lady Falcons completing the season sweep with a 43-22 victory. The Lady Tornadoes (0-23) — who fell to Miller (11-9) by counts of 63-42 and 49-26 in two Tri-Valley Conference Hocking Division meetings — scored the first four points of Wednesday’s game, holding the Lady Falcons off the board for over four minutes. Miller broke its cold spell with a pair of three-pointers within a minute and held the 6-4 advantage at the end of the first period. The Lady Falcons scored the first 11 points of the second quarter and led 17-4 with 4:12 left in the half. The Lady Tornadoes ended the half with a 7-to-4 run, however, trimming the MHS lead to 21-11 at the midway point. 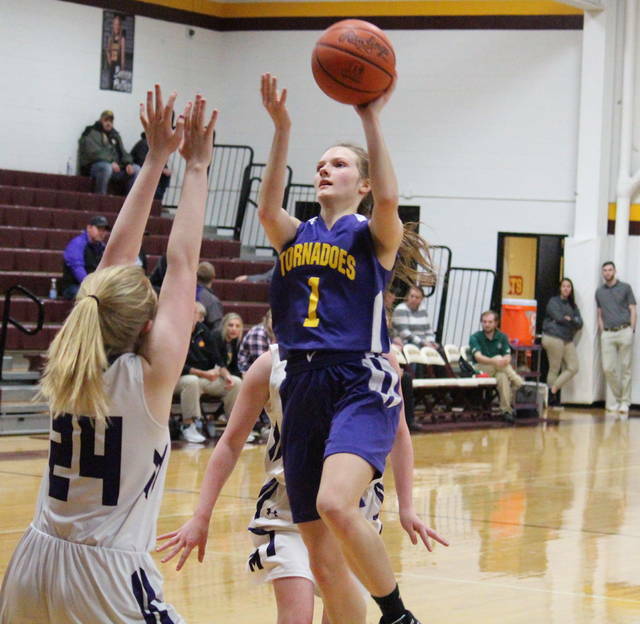 The Purple and Gold were back within single digits after a Phoenix Cleland three-pointer to open the second half, but Miller claimed 14 of the next 16 markers and led 35-16 headed into the finale. The Lady Tornadoes cut their deficit to as low as 16 and trailed by as many as 22 in the finale, ultimately falling by a 43-22 count. Following the season-ending setback, SHS head coach Alan Crisp credited his team and its parents for sticking through the winless campaign. “I’m proud of those nine players, the effort they put in throughout the year,” Crisp said. “It would have been easy with the season we had to jump ship and bail out, but they hung right in there and stuck with it. In the game, the Purple and Gold shot 8-of-39 (20.5 percent) from the field, including 4-of-16 (25 percent) from beyond the arc, while Miller made 15-of-50 (30 percent) field goal attempts, including 5-of-20 (25 percent) three-point tries. At the foul line, SHS was 2-of-5 (40 percent) and MHS was 8-of-14 (57.1 percent). The Lady Falcons won the rebounding battle by a narrow 33-to-31 clip, including a 12-to-11 edge on the offensive glass. Miller also claimed the turnover battle, committing seven and forcing 21. Southern collected six assists, four steals and a pair of blocked shots, while Miller earned 16 steals, 10 assists and one rejection. Leading Southern, Phoenix Cleland and Kayla Evans both scored nine points and dished out three assists, while grabbing 10 and eight rebounds respectively. 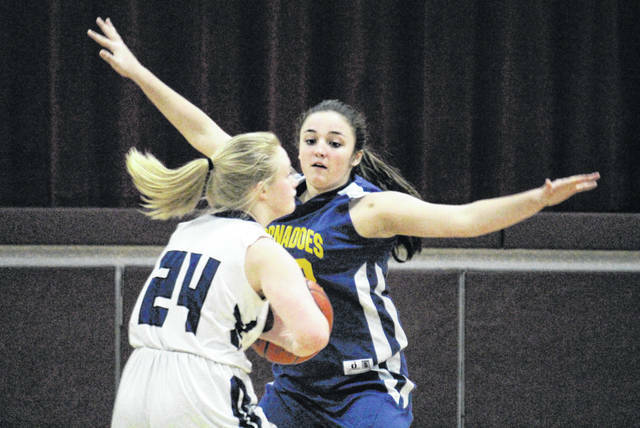 The duo also led the SHS defense, with two steals by Cleland and two rejections by Evans. 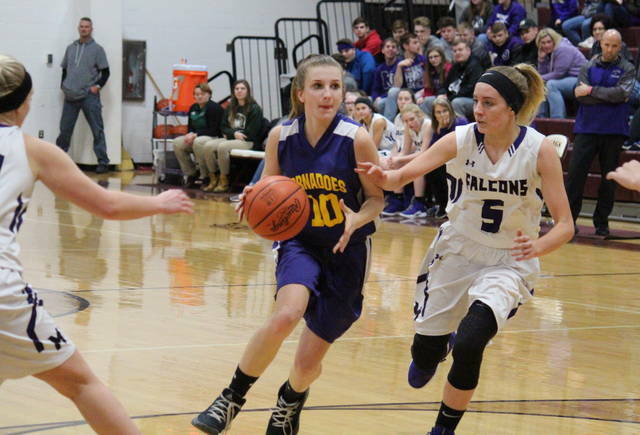 Jordan Hardwick scored three points for the Lady Tornadoes, while Ella Cooper marked one. Ashley Spencer paced the victors with 20 points, nine of which came from beyond the arc. Askya McFann had eight points and five assists in the win, Sophia Compston added seven points and seven rebounds, while Alaina Boyden tallied four points. Josie Crabtree had two points for Miller, while Emma Joseph and Brooklyn Wilson scored one each. McFann led the MHS defense with five steals and a block. The Lady Tornadoes will now say farewell to their lone senior Jackie Dailey, who was missed Wednesday’s contest due to injury. Coach Crisp talked about the strides his team made through the season, but noted that the offseason is the time to improve your individual game to help the team in the long run. “We started the year very, very young, and I thought we made some jumps,” Crisp said. “The Belpre game last week was a tremendous game, I thought that showed how much we have improved. Then, in 24 hours, as good as we played against Belpre was as bad as we played against Eastern. Miller will be back in Rocksprings for the sectional final against second-seeded Eastern on Saturday.